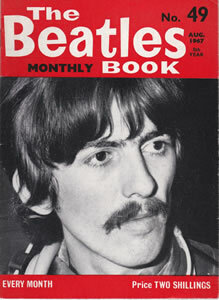 Beatles Monthly Books produced and printed by Thanet Press and published in England by Beat Publications. 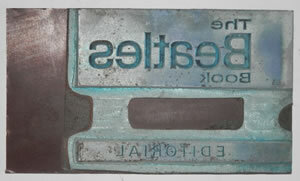 *These are guaranteed to be the actual copper plates used on the original 1960s Monthlies, they are not reproduction. *Unique one-offs, there are no duplicates. 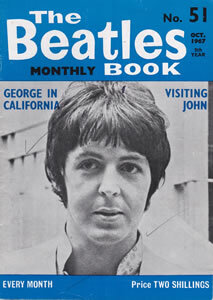 *Come with a Beatles Marketplace COA guaranteeing their authenticity. NOTE: They do not come with copyright. Unique Copper Plate on thin acrylic board for the heading 'The Beatles Book Editorial' which was used continually on Page.2 from issue No.34 through to the final issue No.77. Board measures approx 4½" x 2½". Copper plate measures approx 3¼" x 2½"
Unique Copper Plate on thin acrylic board for the signature of 'Freda Kelly' which was first used on Page.5 in issue No.40 until its final appearance in issue No.61 (apart from Nos.43 and 41). Board measures approx 4½" x 1¾". Copper plate signature measures approx 2" x 1". NOTE: This exact signature was also used throughout Freda's time as the Beatles National Fan Club Secretary on all the Newsletters, which prompts the obvious question; Did the printers of the Beatles Monthlies also print items for the Beatles Fan Club. Answer: Quite probably. And if so this was quite likely the stamp used. Unique Copper Plate on thin acrylic board for the 'Beatles News' which was first used on Page.29 of issue No.34 through to the final issue No.77 (apart from Nos.65, 66, 67, 68, 71, 72, 73, 74). Board measures approx 5¼" x 2¾". Copper plate measures approx 5" x 2". Unique Copper Plate on thin acrylic board for the Front Cover price of 'EVERY MONTH Price TWO SHILLINGS' which ran along the bottom of the front cover from issue No.42 to No.56 (except for No.53). Board measures approx 6" x 1½". Copper plate measures approx 6" x ½". Full page Copper Plate for Page.9 on a plywood block. Measures approx 7½" x 5¼" x 1". Full page Photo and Text Copper Plates for Page.10 on plywood blocks. 1). Text for top of the page. Measures approx 5¼" x 3¾" x 1". 2). Photo of John and George during 'All You Need Is Love' session in the studio. Measures approx 6" x 4" x 1". Very Good condition with some very mild scratching and corrosion spots in a few isolated areas. Note: Some photographic plates were treated with a special permanent black gloss ink by Beat Publications when it ceased publication in 1970 to prevent re-prints. This one was treated so does not appear in negative form. Full page Photo Copper Plate for Page.11 on plywood block (copper plate for the text is missing). Paul and Ringo during 'All You Need Is Love' session in the studio. Full page Copper Plate for Page.24 on a plywood block. Full page Copper Plate for Page.28 of Paul McCartney in negative form on a plywood block. Measures approx 8½" x 6¼" x 1". Very Good acceptable condition with some mild corrosion and surface scratches in isolated areas. Note: Some photographic plates were treated with a special permanent black gloss ink by Beat Publications when it ceased publication in 1970 to prevent re-prints. This one is NOT treated. Full page Photo Copper Plate for Page.3 of Ringo Starr on a plywood block. Full page Photo Copper Plate for Page.5 of George Harrison on a plywood block. Comprising two Copper Plates for Page.13 a full page article on 'Our Visit To Greece'. 1). 'Spot' colour plate for the heading 'Our Visit To Greece' in purple ink. This was added to the previously printed text page on a second print run. Measures approx approx 5¼" x 5" x ¼". 2). Text copper plate on plywood block. Measures approx 7½" x 5¼" x 1". 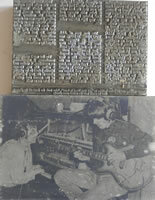 Comprising of two Copper Plates for Page.19 a full page article on 'Letters From Beatles People'. 1). Text copper plate on plywood block. 2). 'Spot' colour plate for the LOVE' Graphic in blue ink. This was added to the previously printed text page on a second print run. Measures approx approx 6¼" x 5½" x ¼". Monthly No.50 Page.21 September 1967 Comprising two Copper Plates for Page.21 the article 'Behind The Spotlight''. 1). 'Spot' colour plate of 'Behind The Spotlight' heading in purple ink. This was added to the previously printed text page on a second print run. Measures approx 5¼" x 2½" x ¼". 2). Text copper plate on plywood block. Measures approx 6" x 5¼" x 1". Monthly No.50 Page.22 September 1967 Comprising two Copper Plates for Page.22 the continuation of the article 'Behind The Spotlight''. Measures approx 7½" x 5½" x 1". 2). 'Spot' colour plate for the two paragraph headings in blue ink. This was added to the previously printed text page on a second print run. Measures approx 5" x 3" x ¼". Full page Copper Plate for Page.23 of Ringo Starr on a plywood block. Note: Some photographic plates were treated with a special permanent black gloss ink by Beat Publications when it ceased publication in 1970 to prevent re-prints. This one is treated. Full page Photo and Text Copper Plates on plywood blocks plus a small text plate on thin acrylic board for Monthly 50 Page.24 on plywood blocks. 1). Photo of George playing a guitar. Measures approx 8½" x 3" x 1". 2). Text 'A Speakeasy Party'. Measures approx 7½" x 2½" x 1". 3). Inserted text for 'Speakeasy' and 'Eric Clapton'. Measures approx 5" x 2". Full page Copper Plate for Page.28 of Ringo Starr in negative form on a plywood block. Full page Photo and Text Copper Plates on plywood blocks plus a small text plate on thin acrylic board for Monthly 50 Page.31 on plywood blocks. 1). Photo of Paul arranging a song at Abbey Road Studios. Measures approx 6" x 4¼" x 1". Excellent condition with some very mild scratching and corrosion spots in a few isolated areas. 2). Continuation of the text from page.24 'A Speakeasy Party'. 3). Inserted text for 'Everyone Was There'. Measures approx 2½" x ½". Full page Photo Copper Plate for Page.8 of John Lennon on a plywood block. Good acceptable condition with corrosion spotting. Full page Photo Copper Plates for Page.11 on plywood blocks. 1). Photo of John outside the front of his house. 2). Photo of John blowing a horn instrument. Both in Very Good condition with some very mild scratching and corrosion spots in a few isolated areas. Full page Copper Plate for Monthly No.51 Page.24 on a plywood block. Full page Photo Copper Plate for Page.5 of Paul McCartney in negative form on a plywood block. Full page with two Copper Plates for Page.23 on a plywood block from Magical Mystery Tour. Good acceptable condition with some mild corrosion and scratches. Note: Some photographic plates were treated with a special permanent black gloss ink by Beat Publications when it ceased publication in 1970 to prevent re-prints. This one was treated. Full page Copper Plate for Page.29 on a plywood block with an article on Beatles News. Measures approx 7¼" x 5½" x 1". Complete page of Photo and two Text Copper Plates on plywood blocks plus two text plates on thin acrylic board for Monthly 52 Page.31. 1). 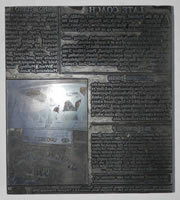 Copper Plate on plywood board for text at the very top of the page 'The 11th Beatles Book Competition'. Measures approx 6" x 1¼" x 1". 2). 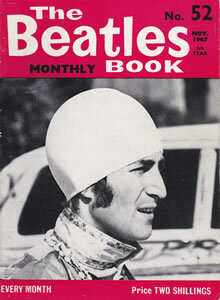 'Spot The Beatle!' in blue on copper plate on acrylic board. Board measures approx 5½" x 2¼". Copper Plate measures approx 5½" x 1". 3). 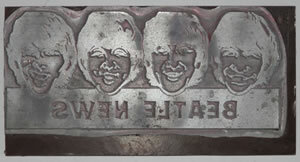 Photo Copper Plate of four Beatles dressed as walruses. Measures approx 6" x 2½". 4). Inserted text for 'Five Crisp New £10 Notes To Be Won' in blue on copper plate on acrylic board., plus line across the bottom of the page. Board measures approx 5½" x 4". Copper Plate measures approx 4½" x ¼". 5). Text Copper Plate on plywood board. The page is complete with all five Printing Plates. All are in Excellent condition. They were printed using the 'Letterpress' printing process (modern printing is by Litho) which is by today's standard very basic. The plates were produced in reverse (mirror image) to the printed page. Paper was rolled over the pre-inked plates with huge pressure using a cylinder print machine (such as a Hiedelberg). The plates were mounted onto thick plywood blocks (precisely 0.918" or 23.3mm thick which was the industry standard) with either a very strong two sided adhesive or with small panel pins, being imperative that they were absolutely square on. Multiple plates were paged up together (possibly up to eight pages at a time), printing first one side then turning the paper over, after the ink had dried, and printing the other side. If more than one colour or exceptional text variation or drawing etc was required, they would have been printed in two or more passes, once in black and then with what was known as the 'Spotplate' (either colour or text). These were thinner (approx ¼" or 5mm thick) with the plates mounted onto a thin tough plastic type material with a very strong two sided adhesive. Sometimes layers of paper were stuck to the back of the plates to build them up so they are all precisely level, which was vital for the ink to print evenly and consistently. When the ink began to fade the blocks were 'inked up' again, which is why you sometimes find subtle variations in colour tone in the Beatles Monthlies as the ink would have required re-applying fairly frequently on such a large print run. The ink was not runny like the ink in a pen, but a lot thicker more a tar like consistency. Sometimes the ink would run down onto the edges of the plywood (depending upon how much ink was applied) with the pressure of the cylinder squeezing it from the surface of the plate. To hold the plates in place (it was equally as vital they did not move) they were placed in what was called a 'Chase' and held firmly in place with what was known as 'Furniture and Coins'. These were not actually furniture and coins! They were a nod to 'Caxton' operating from a church and using bits of broken furniture and bent coins from the church collection where printing in England first began! In the 1960s the printers would have used whatever was convenient or available in the workshop, but usually small pins or nails were used, which explains why some of the plywood block still have small pins still in them. Real Solid Copper Half-tone etchings. 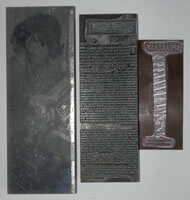 These are the actual solid copper printing plates which were used to produce certain issues of the The Beatles Book. With one of them you could, of course, run off 100,000 prints, but we have had them sprayed by a special process with a glossy black ink so that the normal negative photograph effect has been turned into a positive picture. If you are in doubt as to what you will actually be getting, do please check before you order. Only one of each solid copper half-tone is available, so you will never find a duplication and they are being offered at virtually the cost price. They are ideal for framing to make wall decorations, etc. Some of the photographic plates for sale are still in the negative form, which suggests not all were sprayed and/or sold. 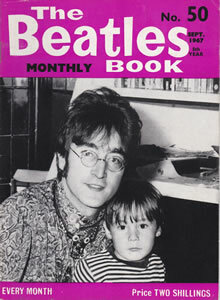 Copyright © 2000-2019 www.beatlesmarketplace.com (& co.uk) all rights reserved.